Instead of injections or other invasive treatments to avoid wrinkles, fight back against aging where it begins—from the inside out. 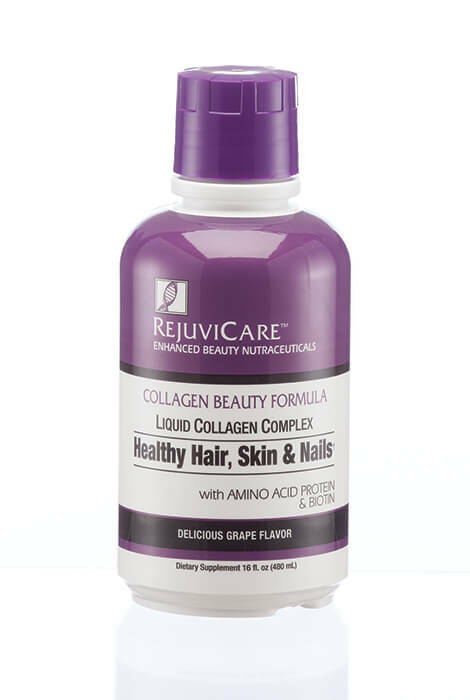 RejuviCare™ Liquid Collagen Beauty Formula is a natural antioxidant supplement that supports healthy hair, skin, nails and joints. Proteins like collagen and elastin help the body revitalize saggy skin, strengthen weak nails and add shine to dull hair, but the body's levels of these crucial building blocks deplete over time. This liquid collagen formula replenishes collagen and elastin, helping tissues maintain elasticity and encourage development of strong connective tissue. The easy-to-take liquid comes in a delicious grape flavor. To use, take 1 Tbsp. daily before bedtime. Contains vitamins, compounds and amino acids. 16 oz. Take 1 tablespoon daily before bedtime, as a dietary supplement, or as directed by a healthcare professional. Other Ingredients: Purified water, fructose, natural & artificial flavors, citric acid, grape skin extract (color), potassium sorbate(to preserve freshness), sodium hexametaphosphate(to preserve freshness), sodium benzoate(to preserve freshness), Tonalin® CLA, calcuim pyruvate, grape seed extract, melon pulp (14,000 IU SOD activity per gram)(Extramel™), and resveratrol.